Le Festival international du film de Durban dont 31ème édition aura lieu du 22 Juillet au 1er Août 2010 a annoncé la liste des films sélectionnés. 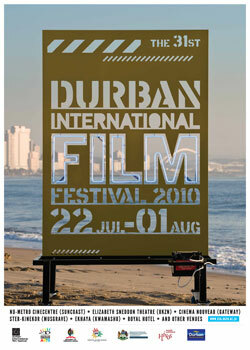 Plusieurs cinéastes seront présents pour présenter leur films et participer aux séminaires et ateliers, ainsi que pour certains au Talent Campus Durban 2010 dont le succès est avéré. Plus de 200 projections sont prévues à Durban et les communes proches. « Above All » de Oliver Schmitz (Mapantsula, Hijack Stories), « A Small Town Called Descent », de Jahmil XT Qubekas, avec Vusi Kunene et Hlubi Mboya. Raoul Peck, sera présent avec « Moloch Tropical », ainsi que Mahamet-Saleh Haroun pour « Un homme qui crie (A Screaming Man), Prix du Jury à Cannes 2010. « The White Ribbon » (Le ruban blanc) de Michael Haneke fait partie de la sélection. Un hommage sera rendu à Ingmar Bergman. Filmmakers are key agents in keeping a watchful eye on threats to human ecology and environmental balance in films such as Scientists Under Attack, and South African Carlos Franciso’s American Foulbrood. When the water that comes out of your taps turns to flame you know something is wrong Gasland explores the shocking consequences of massive natural gas drilling across the USA. On a highly positive note the multi-award winning Waste Land witnesses the creative production that results when art and poverty collide at the worlds largest rubbish dump in Brazil, while the 4th Revolution: Energy Autonomy outlines the tantalising possibility of switching to 100% renewable energy sources in the next 30 years. flagship screenings in DIFFs community programmes. The line-up includes award winning South African film Father Christmas Doesn’t Come Here, and the winner of the Berlin Today Award 2010, Jonah And The Vicarious Nature Of Homesickness, as well as a crop of hot films made by emerging AFDA film students. The Latitude package, supported by the Goethe Institut, presents an excellent array of 9 contemporary African films which includes Jan-Hendrik Beetges Abyss Boys, recently named best short film at the African Movie Academy Awards in Nigeria. Theatre; Nu Metro Cinecentre – Suncoast; Ster Kinekor Junction Musgrave; Cinema Nouveau – Gateway; Ekhaya Multi-Arts Centre in KwaMashu; and The Royal Hotel, with further screenings in township areas where cinemas are non-existent.